In the weeks since Christmas, despite the post-holiday letdown, there have been some high points. These include a very popular hand-me-down from a family at our church - namely, the purple car pictured above (note George Monkey; he is still quite popular). 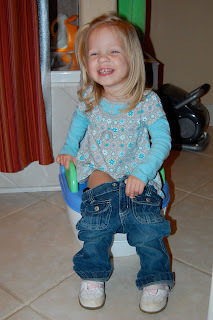 Another highlight was the purchase of her first potty chair (no, she is not potty trained, but she certainly does think this novelty is a thrill). And other than that, life is pretty much status quo... for now. Stay tuned for more excitement in the next seven weeks or so as we prepare for the arrival of Baby Brother! And her very first dollhouse! 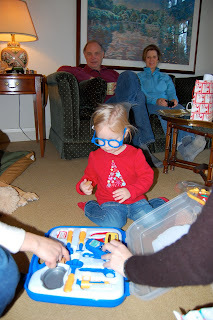 This Christmas was Linnea's first celebrating with Mommy's side of the family in New York. Above and below are shots of some of her favorite Christmas gifts - a stuffed "George Monkey" (a.k.a. 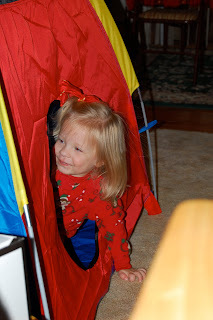 Curious George) and an indoor playtent from Nana & Papa. Below are shots of her favorite parts of the trip, though - love and adoration for her cousins Evan (age 10) and Kelsey (age 8). 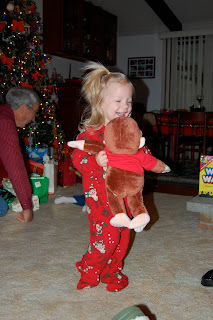 PS - Yes, we did dress her while we were away; it is sheer coincidence that she is in her pajamas in all of these shots. I swear.